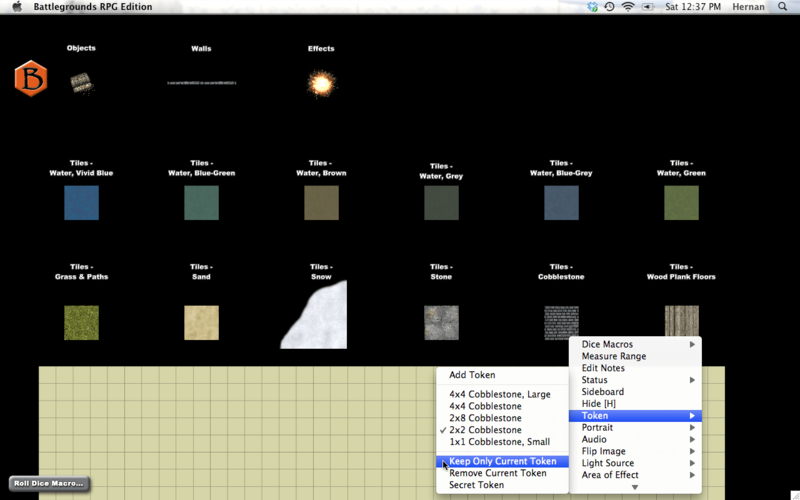 This artpack consists primarily of mapping tiles, ranging in size from 8×8 squares to 1×1 squares. The artpack contains a total of 216 pieces of art, and supports mapping out both exterior and interior locations. While the artpack is best for fantasy/medieval settings, many of it’s contents will be equally suitable for use in other genres. The tiles do not have a grid printed on them, so they can be used with either a square grid or a hex grid overlay in Battlegrounds. All artwork in this artpack was either created by professional cartographer Corey Macourek, or derived from his work in some way (e.g., color mods, combined/separated elements, etc.). More specifically, from his “Mapping Adventures: New Expeditions” product. If you are familiar with Paizo’s GameMastery line of maps, you may already be familiar with Corey Macourek’s spectacular work. “Objects” includes things like bones, books, maps, scrolls, tables, chairs, thrones, torches and treasure chests. “Effects” include things like blood trails, spell/energy orbs, and fireballs/explosions. All the artwork is high-resolution (122 pixels per cell), so it won’t pixelate even at full zoom in Battlegrounds, and has been organized into logical categories, for faster mapping. The artpack file is 39.8 MB zipped, and 67.3 MB unzipped. 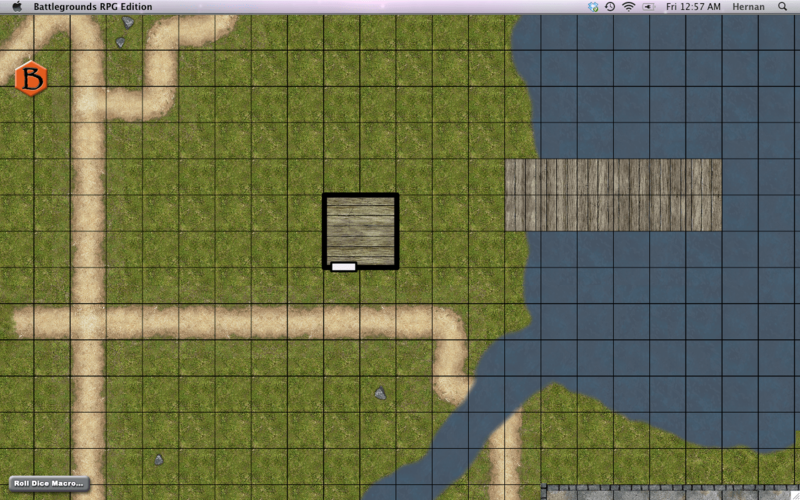 “Mapping Tiles Pack 1” costs $8.00 for GMs (but, like all artpacks, is free for players). This is the lowest-priced artpack for Battlegrounds, so I hope it proves popular. Here are some preview pics created using this artpack. Be sure to click on each thumbnail image to see the full-size image. 1. A basic map layout, created using only elements from this artpack (except for the walls and door of the guardhouse in the middle, which were created with Battlegrounds’ built-in drawing tools). Yeah, the footpath is a little non-sensical in it’s layout, but I was just improvising and trying to utilize all the various path segments available (sometimes at “off-grid” angles, for a more naturalistic effect). 2. Some finishing touches to complete the layout. 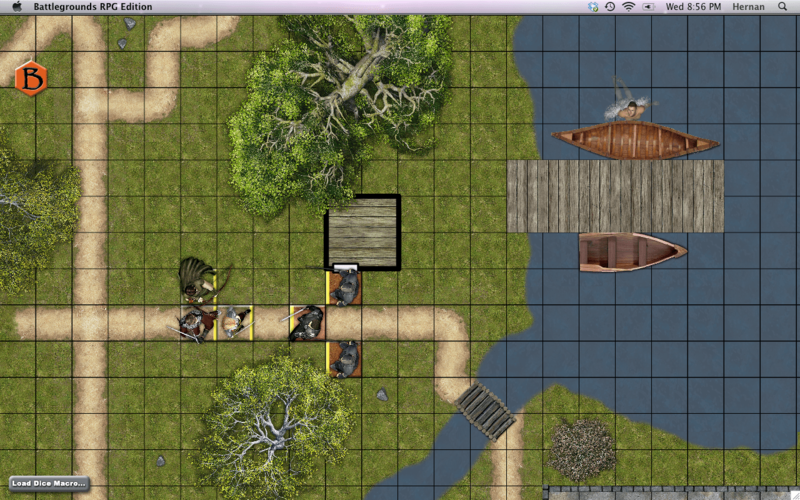 In this case, I used a handful of trees from “Kepli’s Tree Pack 1“, figure tokens from “Vry’s PC & NPC Tokens“, and a rowboat, canoe, and bridge pulled from the Dundjinni forums. 3. 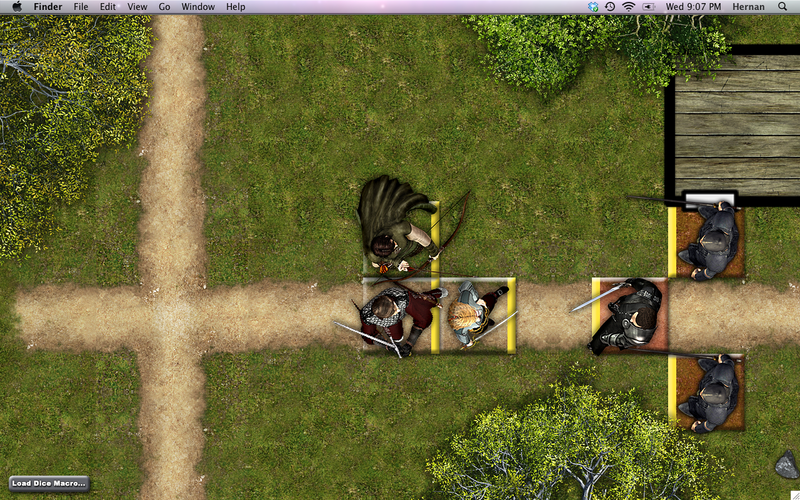 A close-up, this time with the grid overlay hidden, so that you can see all the lovely detail in the textures.